The fat envelope which should reach you very soon contains, as well as the ‘Collector’, a special publication - the Society’s second impression of 'This Once Was Us’, produced by a collective of members of the staff of Penguin Education in the late 1960s and early 1970s, and telling the inside story of this important late flowering of Allen Lane’s ideal. 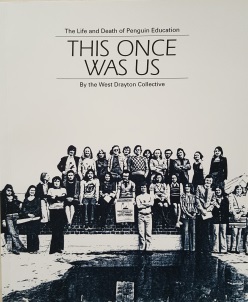 With the books come details of the Annual Meeting, to be held in Reading on 12-14 October, the Annual Report and Financial Statements, a proxy form for the AGM if you can’t attend in person, a small addendum slip to last Christmas' Picture Puffin checklist … and a small surprise. Marking the milestone of reaching issue 90, the ‘Collector’ has a special cover, and starts with eleven short pieces on each of the Penguin books numbered 90 - a Special, a Pelican, a Puffin, a Handbook, some Poets, and so on. These are followed by our Bursary winner’s dissertation on Penguins during WW2, and by a substantial article on the Pelican History of Art. Then book reviews, more descriptions of symptoms of Penguin-lover’s syndrome, numerous shorter pieces, on subjects ranging from Penguins' Italian precursors, ‘The Crows’, to the art of Picture Puffins and a photograph of Penguins that fly. Our photo, with the final proof copy of the ‘Collector’ was taken on the parched lawn of our Editor, James Mackay. He is also the person to contact if you’ve any unresolved queries about the Annual Meeting too. We do hope that many members will book to attend another fine day of Penguinographical conversation, but, in October, perhaps not quite as hot as July.